Fresh, dried catnip leaves attract and intoxicate cats. Used to treat colds and flus as well as upset stomachs. Fresh leaves can be used as meat tenderizer and marinade. Also used to make a natural light yellow dye. 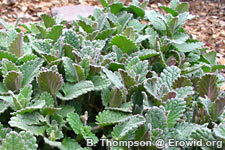 A perennial, minty-smelling herb, growing upright from 1-3 feet tall. The branching square stems and toothed, heart-shaped leaves are covered with downy gray hairs, giving the whole plant a grayish-green appearance. Clusters of white or pale lavender flowers grow at the ends of the branches.